Vincent van Gogh (1853-1890), The Sower, 1888, Van Gogh Museum, Amsterdam, (Vincent van Gogh Foundation). AMSTERDAM.-Over 120 rarely exhibited letters by and to Vincent van Gogh (1853-1890) will be on show Landmark exhibition to celebrate the publication of the new edition of the letters. From 9 October 2009 to 3 January 2010 the Van Gogh Museums Rietveld building will be devoted to the letters of Vincent van Gogh. In the exhibition Van Gogh's letters: The artist speaks, some 120 original letters will be exhibited alongside the works that Van Gogh was writing about. The important documents are seldom or never on show to the public due to their extreme fragility and sensitivity to light. The combination of more than 340 works, from the rich collection of the Van Gogh Museum, including paintings, drawings, letters and letter sketches offers a multifaceted and penetrating view of Van Gogh as letter writer and as artist. Especially for this exhibition the Van Gogh Museum has been granted the exclusive loan of three special letters from Vincent van Gogh to the artist Emile Bernard (1868 -1941) from the Morgan Library & Museum in New York. The exhibition is being staged by the Van Gogh Museum to mark the launch of the new international edition of the complete correspondence of Vincent van Gogh. This scholarly edition, which will be published both in book form and digitally, is the culmination of 15 years of research into the letters by the Van Gogh Museum and the Huygens Institute of the Royal Netherlands Academy of Art and Sciences (KNAW). Van Gogh's letters: The artist speaks - The exhibition offers a unique opportunity to compare the sketches in the letters to the paintings and drawings on which they are based. Van Gogh's own writing and his intimate sketches allow the visitor to look over the artist's shoulder, as it were. Never before have we been able to come so close to Van Gogh as an artist and as a person. The visitor is witness to his dreams and disappointments, friendships and fights, the battle against his illness and his all-consuming passion to create art able to withstand the test of time. 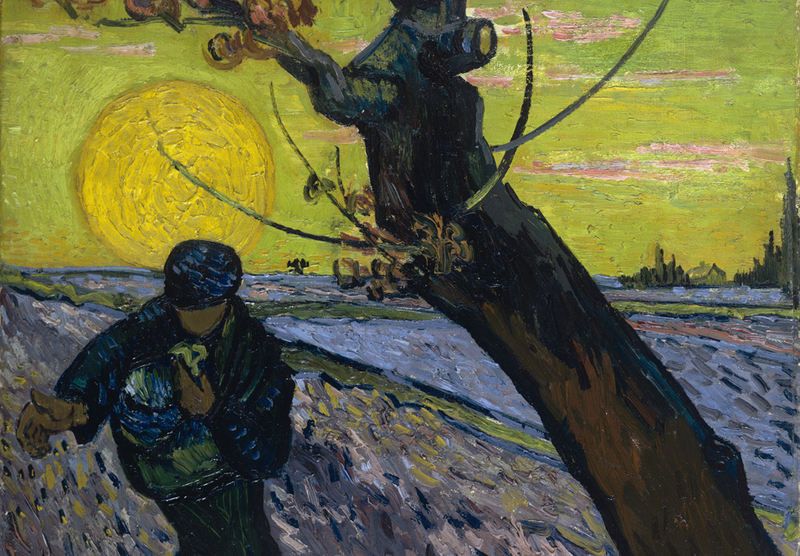 Quotations from his letters guide the visitor through his paintings and those of his contemporaries, offering insights into Van Goghs views on art and the role of the artist. By far the most of the letters are addressed to his younger brother Theo, who supported him morally and financially during the ten years of his artistic career. As such the close bond between the brothers is one of the exhibitions important themes. Vincent viewed his artistic vocation as a joint venture and apprised Theo of all his plans and all the developments in his art. The fifteen years of research into the letters by the Van Gogh Museum and the Huygens Institute  KNAW has yielded a more rounded, comprehensive and nuanced image of Vincent van Gogh. Rather than a deranged genius, the artist is revealed as a determined and forceful personality, able to express with compelling force the subjects occupying his mind. Vincent van Gogh (1853-1890) not only bequeathed to the world a large number of fine paintings and drawings, but he also left behind one of the most fascinating bodies of artistic correspondence that we know. Over 800 of the 902 letters known to have been written by and to Van Gogh are kept in the Van Gogh Museum. Over the last fifteen years all the letters have been subjected to rigorous examination by specialists of the Van Gogh Museum and the Huygens Institute - KNAW. The result is a scholary edition, which will be published both in book form and digitally. Book edition - Vincent van Gogh - The Letters. The Complete Illustrated and Annotated Edition contains all the letters - complete with explanatory notes and for the first time reproductions of the more than 2,000 works of art mentioned in the correspondence as well as reproduction of the letters which contain sketches. The letters have been included in their original form without embellishment, rephrasing, adaptation or excision of passages, newly transcribed and translated. Web edition - Coinciding with the book edition is the launch of the website www.vangoghletters.org. The website comprises all 902 letters by and to Van Gogh in the languages in which they were originally written (Dutch and French) and furnished with the English translation. The letters are accompanied by images of the manuscripts together with the annotations and the illustrations of the works of art referred to in the correspondence. The web edition furthermore offers extensive search facilities and is freely accessible from 8 October 2009. Benefactors: The Van Gogh Museum would like to thank the Turing Foundation, the Prins Bernhard Cultuurfonds, the International Music and Art Foundation, Linea dOmbra and the Vincent van Gogh Foundation  which has given the vast majority of the letters on long-term loan to the museum  for their exceedingly generous financial support. The contribution and expertise of Metamorfoze, the National Programme for the Conservation of Heritage on Paper, enabled us to record the entire letters collection digitally. In addition the Letters project was made possible with the aid of the Orentreich Family Foundation and donations by Shigeru Myojin and Sherif Nadar, as well as by Ernst Nijkerk, in memory of Inge Nijkerk  von der Laden. Christo and Jeanne-Claude to Attend Philbrook Museum of Art's Screening of "The Gates"